The Vicar writes: We love, and are very proud of, our historic and magnificent church – but if we look at it honestly it is in many respects really rather shabby and in need of renovation. Before I came I was told that there was the most urgent need for a reasonable provision of lavatories and a respectable kitchen: now, only ten years on, we can unveil the masterplan that the Fabric Committee has been working on over a long period with our architect. It incorporates many elements suggested in a couple of open church meetings and in discussion by the Church Council, and now has the general approval of the Church Council and the Diocesan Committee – but is of course a very long way off being put into commission. We agreed that the most responsible way to tackle the issue was to work out a masterplan that included EVERY improvement we might wish to make, then raise funds and do the detailed specification for one section at a time, responding to the highest priorities. This way everything will eventually fit together, rather than some parts needing to be adjusted to fit subsequent work. This is a very ambitious and expensive programme indeed – but it’s far easier to scale down from the ideal than to try to scale up from too modest a proposal. Of course, if you happen to have £7m to donate to your favourite parish church, we could do the whole lot in one go. But, if no-one steps forward, each individual element, although still costing a great deal of money, should be achievable bit by bit over a decade or two. Many people have little idea of how much the appearance and finish of our church does not represent what Gilbert Scott left us in 1872 – but is instead the result of the repairs carried out with inferior materials following the bombing and burning-out of the church in WW2. The main structural need for the church is completely to renew the high Nave, Aisle and Transept Roofs. Services: we need to rewire the whole church, provide completely new lighting, and a new far better flat stone floor with even underfloor heating throughout. The whole interior needs to be cleaned, the splendid historic monuments cleaned and restored, and the ceilings and timberwork repainted. A completely new services block to the north of the north aisle, low enough not to obascure the aisle windows, containing new kitchen, wheelchair access, three unisex wc cubicles and gents urinals. The magnificent font moved from its present unworthy corner position to the south side of a grand open West Bay Narthex, a marvellous space for gathering, display and exhibitions etc, created by removing three rows of pews. For the fullest services we will fill this space with seating to accommodate the congregation. Moving the font enables us to insert new doors to the kitchen and WCs. The great West door will now have a Glass Vestibule so that during daylight hours passers-by can always see straight in, and providing a draught and noise buffer for those arriving late for services. 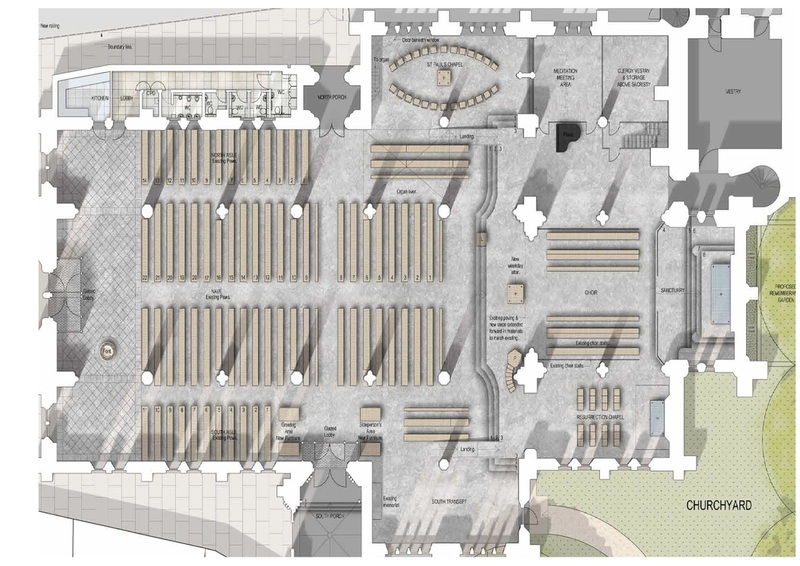 Outside, the west churchyard will be completely reordered, to provide a far better space linking church and school, with a wide paved area immediately outside the church, graded so that wheelchairs can access the west door. The south door will have a similar Glass Vestibule, achieving the same purpose. There will be properly designed Sidemans and churchwatchers welcome desks and furniture. Rearrangement of the pews in the north and south aisles will give better sightlines and provide space for wheelchairs. The choir and sanctuary will be cleaned and restored so that the magnificent woodwork, mosaics and frescos can be properly appreciated. The postwar St Paul’s Chapel in the north transept will be entirely re-ordered – the stone altar and screen removed from blocking Scott’s beautiful double arches into the clergy sacristy; these arches filled instead with (engraved?) glass screens. The chapel will be furnished as an informal, flexible worship space – so that we will have two contrasting side chapels for weekday and smaller services: the Resurrection for traditional liturgies and the St Paul for contemporary, informal worship. The old, irreparably damaged pipe organ will be removed from its bay, and in its place three rooms reached by a new stair – ground floor servers vestry, first floor clergy vestry and above that Virgers store etc. The present clergy sacristy – which has one of the finest stained glass windows in the church – will be glazed in to provide a private but visible space for meetings, meditation, counselling. A magnificent new Pipe Organ will be built in a new position, high up in the second bay of the nave, on a gallery and bracketed out from the north wall. Acoustically, this will be immeasurably superior to the old location, buried behind thick stone walls. This new position means that a smaller instrument will sing out far more clearly, leading the congregation and supporting the choir in the worship and praise of almighty GOD. We do hope that you are inspired by these proposals, and consider that they provide a sound framework for the renewal of our church. Do contact Vicar or Wardens if you want to find out more, or wish to help us to realise these plans.